First, read the research paper. The abstract is replicated below. Familiarize yourself with the mathematics, the materials, and the instruments. We observe stable holes in a vertically oscillated 0.5 cm deep aqueous suspension of cornstarch. Holes appear only if a finite perturbation is applied to the layer for accelerations a above 10g. Holes are circular and approximately 0.5 cm wide, and can persist for more than 106 cycles. Above a ~ 17g the rim of the hole becomes unstable, producing fingerlike protrusions or hole division. At higher acceleration, the hole delocalizes, growing to cover the entire surface with erratic undulations. 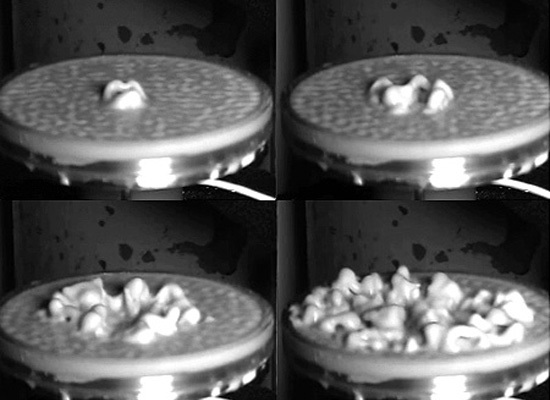 We find similar behavior in an aqueous suspension of glass microspheres. And so: you construct mega-scaled oscillating machines, ones that can create optimum viscosity without cornstarch, all which then get tossed into Lake Michigan. You watch as the waters begin to protrude, becoming a mass of hysterically delocalized pillars slithering upwards, outwards, onwards towards the shore. To Chicago. Hydrology is coming to get you! And not just you. The urban grid, Jefferson's Land Survey, Burnham's neo-classical city plan, even Frederick Law Olmsted's carefully constructured park systems — all dissolve as they meet the edge of chaos. People will scream and faint; they will have nightmares for sure. But of course, we'd like to imagine that it will be greeted enthusiastically as yet another marvelous Chicago open space project: the New Millennium Park. The city's new watery skyline. And then it becomes sentient. Uh oh. If you can spare a bit of metal, a morpho tower in Lake Michigan might be enough to cow the natives.